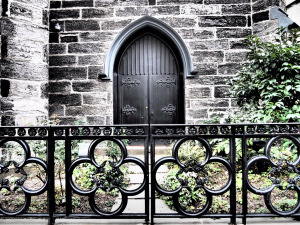 My first post in 2015 is the side door taken in NYC last fall. I’ve been on a mini retreat, but back. Enjoy! On the streets of NYC on an autumn day, walking from here to there to get there. I notice a church is under renovation, but still open. I make a mental note to come back for a visit. There is door off to the side under all the tall rusted steel poles and planks. I pull out my Olympus and take a shot. You’re familiar with that feeling. Could this be Grace Church? Any NYC followers to confirm this?